Since the turn of the year, Little Missy dropped her late morning nap. This means that I have an active toddler for the whole morning! It has its fun side, she’s my little companion (shadow? ), accompanying me while I grocery shop, run errands and even go on fun downtown trips (after Hubby-jr goes to school). When we’re not out, we enjoy slow mornings at home. The flipside is that she can sometimes (more than sometimes?) demand more attention than I can spare. It can be pretty annoying, not to mention a test of my patience especially when I’m trying to get the house chores done. She’ll keep yelling, “Mommy, come. MOMMY! COME! COME!!! MOMMY!! !” Yes, 2-year olds can be very persistent and often suffer temporary memory loss of the terms, No or Wait. “Later” to them means, a second later! It is brilliant. She’s happy and I hope she eventually does help me with real washing (one can hope right?). I get the dishes done and best of all, we have our bonding time over the sink! Yes, this is how I do it. A dining chair, a sponge brush, a plastic bowl and some soap water (I usually give her more, she’s almost done in this picture). And oh yes, she usually needs a change of clothes after this. Next I’m getting her an apron! Yes, you hit the nail on the head. I learnt from my no.1 just how fast babies grow up. I still miss the times I had just with him before no.2 came. After Little Missy came I was so exhausted the first year that I missed out so much of his growing up then. So yes, with Little Missy, I’m making the most of every moment I have left before she enters the “education” system. Too cute … and brilliant! 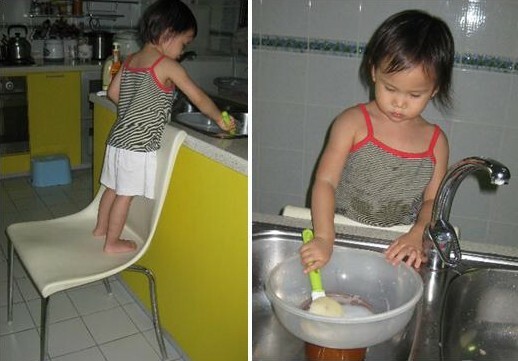 I love the idea of the sneak attack, training her to take over washing dishes for you in the future. Good call!